This weekend I got to test out how my legs are doing with my Graston’s treatments so I kicked the tires so to speak. Saturday I was hoping to be out for longer, but a nearby neighborhood garage sale meant there were cars and people everywhere. So instead I went home after 4 miles to get started on house projects. I was super tired though and passed out early so I didn’t get as far as I would have hoped. Sunday I got up and got right back to house projects. After lunch Rob and I decided to take our bikes out for a spin on the roads. We rarely get around to riding our bikes and it’s been basically on the trainers so this would be our first official outing outside of our neighborhood together. 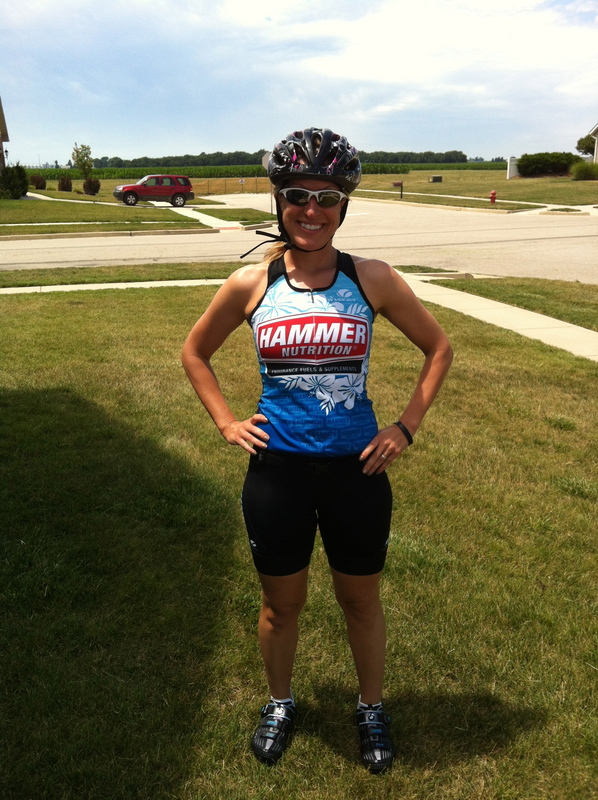 Me in my new Hammer triathlon top and shorts. I love the Hawaiian style design and the purple sections in the back. We rode on the country roads and kept things slow so we could get adjusted with how our bikes feel. As we left the neighborhood Rob says “you remember how to clip out right?”. I’m like “yes, duh, I totally do”…..I did remember how, I just put things in the wrong order. When we got to a turn around point and went to stop I slowed and I didn’t unclip my foot first and then stand up, instead I stood up and as I tried to unclip my foot my bike slowed all the way down and I slowly started tipping to my left, in what felt like slow motion, as I tried three more times to unclip my right foot. Then bam! 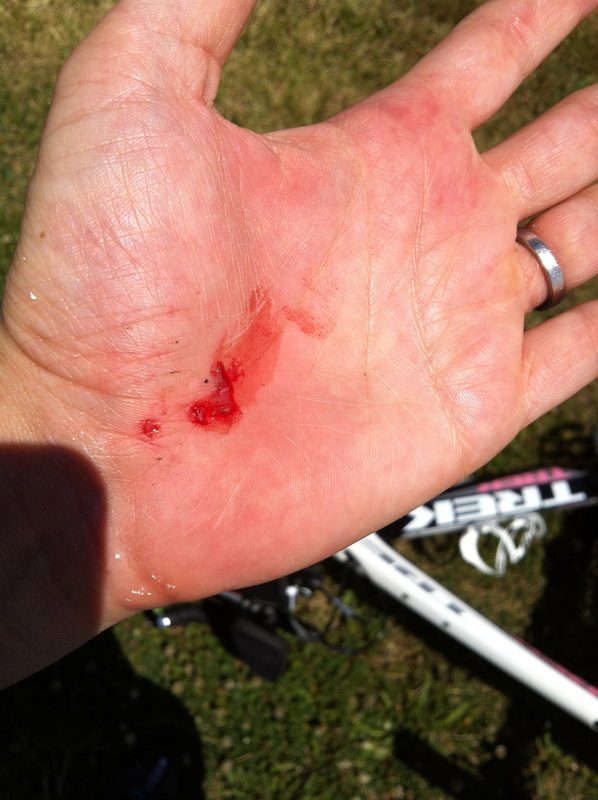 I was on the ground clipped in, like a newbie, with my left palm scraped. Luckily there weren’t any cars around durning this time to run me over. I could care less if a car saw me looking like a loser, as long as I’m still in one piece, that’s all that matters. Rob was able to free me from a shoe so I could wiggle out from under my bike and then wipe my bloody hand on the top of my sock. My right hip feels sore, but nothing serious. Rob asked me what was my method for getting out of my bike, since I had assured him that I knew what to do and he gently reminded me to unclip first, then stand up. No tears were shed and I wasn’t shaken too badly so we headed back and I successfully dismounted in front of our house without going splat. Then I ran 10 miles on the treadmill completely free of any hip pain or tightness, it was glorious!! It felt amazing!!! I couldn’t stop smiling! I haven’t ran 7:25 pace comfortably in a long time and it felt so good to feel back to normal again. I did stretching afterward and I hope that things continue to stay on track. Way to go on your 10 mile pain-free run today, impressive with everything you’ve been going through. As for the bike, I’ve gotten “stuck” many times and tipped right over. Good luck getting the hang of that. Thanks Jamie! I hope your training has been going well! Will you be at Bix? 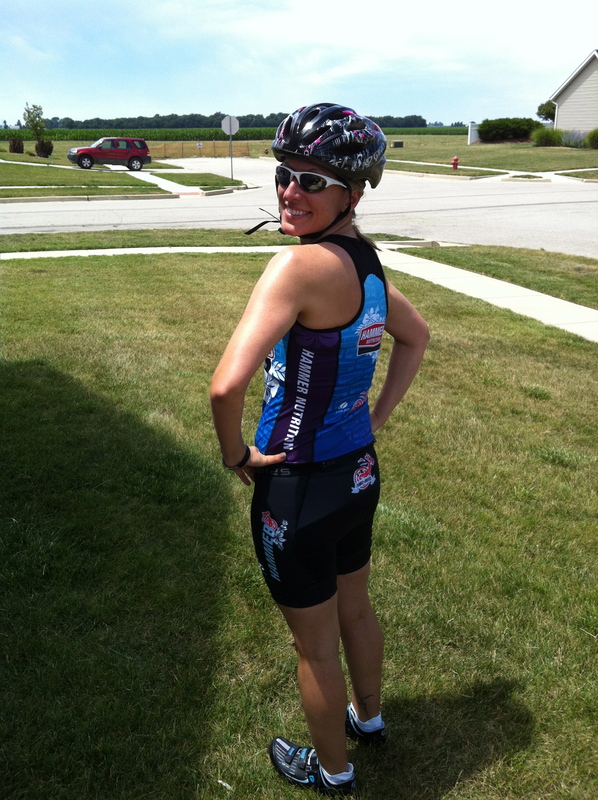 Trying to figure out what duathlon or tris that we may fit into our schedules. Rob has his eye on a sprint tri at the end of Sept. I feel like I have a lot to learn in swimming and cycling to prepare. I’m sure my fall will be spectacular and will involve lots of witnesses. Congrats on running pain free again! I am pretty sure I have had that exact same hand injury! 🙂 And isn’t it crazy how slow motion the tipping over thing is. I am glad you are okay, the bike too! And great news about the running!! Love to see you guys doing some tris! They are much fun and the required cross training does nothing but help your running!